A new woman shall soon be worthy of Mjolnir (m-yo-ll-neer), but a lot of characters have wielded Thor’s hammer (that is not a euphemism). Let’s see who all were worthy of the power of Thor! But first, what does holding the hammer mean? Being “worthy” is vaguely defined and left up to interpretation, but one assumes that it has to do with whatever quality viking gods would deem important for an honorable warrior - this is why Captain America, a valiant soldier, can lift it, but Spider-Man, with an almost unshakable moral code of power and responsibility, cannot. Once you have the hammer, you are often granted various powers of Thor’s: super strength and lightning generation at the very least. Some undergo a complete transformation into a Thor-like god, others do not. The reasons for this have not been adequately explained. All those who have successfully held the hammer are bound to all other hammer-bearers. Hammer-bearers can summon each other by holding a hammer (any hammer) and praying for help. Any other hammer-bearer that happens to be holding a hammer at the time (again, any hammer) will hear the call. Although they haven’t actually held Mjolnir, other hammer-bearers recognized as such by Thor include Storm, Kevin Masterson (more on him in down below) and Tarene (also known as Thor Girl). For the record, there have been plenty of alsorans - alternate reality hammer users, people who had fake hammers (like Deadpool and Storm), and others - but these are the ones that the Mjolnir of Earth-616 found worthy. This also won’t include anyone who used technology to lift the hammer (like Hepheastus), lifted it by moving around sand (like Quicksand), moved it by moving the Earth itself (which is a thing that happens), “lifted” it in zero gravity (like Red Hulk), or possessed it through enchantments (like Enrakt). Doctor Donald Blake may or may not have ever existed. It’s a long and convoluted story. Reader’s Digest version: Thor was a jerk, so Odin transformed him into a human so he could learn humility. His human form was apparently based on that of Dr. Keith Kincaid. At some point the Don Blake personality merged with the Thor personality. Then they split up. Then they re-merged, then... eh, best not to think about it too much. At one point, Thor’s ex-gal Jane Foster married Keith Kincaid (does he count as being a lesser version if he was technically the original? ), but they split up. Eric Masterson had a long strange journey as Thor’s friend. He was an architect who befriended Sigurd Jarlson - a glasses-wearing alias used by Thor when he couldn’t transform into Don Blake (imagine that, a super-strong guy disguising himself with glasses) - only to be forced into the role of Thor when the Thunder God was thrown into a bag in Hell by Loki (another long story). When the real Thor returned, Eric was given his own enchanted mallet, called Thunderstrike, and became a hero, also called Thunderstrike. 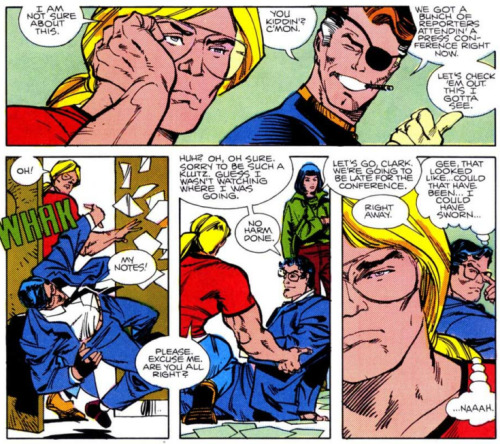 When Thor first met Eric, he had premonitions of an ill fate that would eventually befall Eric, and these omens proved true when, as Thunderstrike, Eric was forced to take on the power of the evil Bloodaxe (and in the process, becoming the most 90s hero ever) to save the world, and in doing so, sacrificed his life. Eric’s soul was offered a spot in Valhalla, but he opted out, choosing Heaven instead. Go fig. Eric’s son Kevin, who was made an official hammer-bearer by Thor when he was a child, eventually took up the mantle of Thunderstrike. Kevin Is convinced that some day he’ll meet the same kind of horrible fate his father did. Now things get complicated (wait, weren’t they already?). A human EMT named Jake Olsen died during a battle between Thor and the Destroyer (y’know, the giant robot in the first Thor movie?) while the machine was possessed by the spirit of a military man, Col. Preston Case. Thor was resurrected in Jake’s body, sort of. The whole event was manipulated (knowingly or not) by Hela, Marnot (who is the third of Odin’s two ravens) and the Dark Gods. Eventually Jake’s spirit was set free and Thor called it a day. Roger “Red” Norvell was allowed to become Thor just so he could die - and yet he’s still alive over 30 years later (about 10 Marvel years, before you ask). Loki wanted someone to steal Thor’s thunder (so to speak) and Odin wanted someone else to die during the events of Ragnarok (the prophesied end of the gods), sparing his son the risk - in the end, human cameraman Red was turned into Thor. Red’s clashed with the real Thor a few times over the years, but generally speaking all the Asgardians tolerate Red with a begrudging respect - heck, he saved all their butts when Thor was dead for a year (he got better). Although not shown using them in the picture above, Red often uses Jarn Griepr (Thor’s iron gloves) and Megingjord (Thor’s belt of strength). Eventually Odin gave Red his own hammer, but if it has a name, it hasn’t been revealed yet called Crusher. Beta Ray Bill was made Thor to prove a point. Monstrous by human standards, Bill was a noble and honorable warrior, so when he needed to fight for his people he took up Mjolnir. He initially fought with Thor and the Asgardians due to the confusion (the gods weren’t expecting someone other than Thor to gain his powers without their say so), but Bill proved his worth, and Odin granted him the enchanted hammer Stormbreaker! Steve Rogers has held Thor’s hammer more than once, the first time he wasn’t even Captain America. During a period in which Cap was disillusioned with the American government and was just calling himself “The Captain,” he fought with the Avengers against Seth, the Egyptian god of death. Thor was down for the count, so Cap picked up Mjolnir and persevered. More recently, Cap took up the hammer to inspire heroes and civilians alike during the Fear Itself conflict. What? Wonder Man? Uh, yeah... anyway, Simon Williams, the guy who’s died more times than Jean Grey and mostly uses his phenomenal superhuman powers to get acting jobs in Hollywood once wielded Mjolnir. Thor’s enemy (and sometime lover) the Enchantress gave Simon additional powers by stealing them from the Avengers, turning him into a god. Simon called upon Mjolnir to help him resist Enchantress’ seductive promises and freed the other Avengers, giving the powers, and the hammer, back to Thor. Okay, we did confusing, now let’s do weird. Apparently there was a young man named Simon Walterson who was cursed by a gypsy into the form of a frog. He took on the name Puddlegump and met Thor in the ponds of Central Park, when Thor was also cursed as frog (it happens). Thor eventually got his hammer back and transformed into the Frog of Thunder! During the subsequent battle, a sliver of Mjolnir fell to the ground (this isn’t the kind of thing that happens often, so maybe Odin was involved?) and Simon/Puddlegump transformed into Throg! He now serves proudly as the only human-language-speaking member of the Pet Avengers. During the Heroes Reborn debacle many heroes were “killed” and resurrected in a world created by Franklin Richards - but not Thor. Instead, Franklin subconsciously created his own version of Thor, complete with a new Mjolnir (this one had a long handle). When the original Thor returned, the faux Thor sacrificed his life to save the other Avengers. Later, Franklin rebuilt this world, creating new versions of Earth’s heroes, including Thor. That story was a bit ambiguous, but it’s possible this Thor still exists on Counter-Earth, orbiting the other side of the sun! The villainous Mad Thinker designed his Awesome Android to mimic any ability or power, little did he know that when the Android mimicked Thor’s worthiness, he would take on a life of his own. Now imbued with morality, the creature renamed itself Awesome Andy and sued for independence, eventually joining She-Hulk’s law firm. When he lost out on love, Andy wiped his memory and went back to being a mindless minion. Andy was an android, but it was his worthiness that allowed him to lift the hammer. Air-Walker also lifted the hammer, and at the time Thor assumed it was only because he was a non-living android that he was able to do it - but since then other artificial beings have been unable to wield it. However, before Air-Walker became the undead indentured servant of Galactus, he was a living being - an honored member of the Xandarian Nova Corps. Before and after his transformation into a Herald of Galactus Gabriel Lan has been a worthy warrior. This one’s kind of a doozy. During one of the many times Thor was dead, Reed Richards, Tony Stark and Hank Pym (actually a Skrull-Pym) created a cyborg clone of Thor and used him to fight other superheroes, even killing Bill Foster, Giant-Man. Yeesh. Anyway, the cyborg-clone was eventually destroyed, only to be rebuilt, destroyed and rebuilt again. Eventually the creature chose the name Ragnarok for himself, but he was tired of being Thor’s shadow. After his fake Mjolnir was destroyed, he proved himself worth of Mjolnir, keeping it for himself. The version of Mjolnir Ragnarok uses is technically the Earth-616 version, but it was part of a piece of reality sealed off in a pocket dimension by AIM scientists. After that version of reality was destroyed, Ragnarok got to keep the hammer. I know what you’re thinking, this has got to be alternate reality, right? Actually, no. These crossovers are actually part of Marvel Universe canon, so while the New 52 versions of Superman and Wonder Woman may or may not remember meeting Marvel heroes (or Thor remembers it without his underwear), the Avengers still remember meeting these heroes from “a Distant Cosmos.” Wonder Woman is worth of Mjolnir just by virtue of being Wonder Woman, but Superman was only worthy of Mjolnir because circumstances demanded it; as soon as the battle was over, Supes couldn’t keep it up any more. Poor Hulk once thought he was worthy because he was holding Thor’s hammer when Thor called it too him - basically Hulk just held on while Thor moved it around. Spider-Man 2099 (who currently has a comic book!) is destined to one day be a hammer-bearer. Although it’s of dubious continuity, the eldest member of sibling superhero group Power Pack, Alex Power, may have once possessed the power of Thor. Loki messed with Thor’s chronological age, turning him into a baby, a child and an older man, so Alex had to step up and take charge. Marvel once gave a bunch of heroes their own Mjolnir-type weapons as members of The Mighty. Supposedly the weapons were all smelted after the battle was over, but Red She-Hulk still has her sword, so who knows?